Dozens of Samsung engineers have written important papers. They are now appearing on most 5G shortlists in the parts of the world they are ready to service. They supply the biggest network in India, two major in the U.S., Japan, and soon Europe. Almost a year ago, Verizon CEO Lowell McAdam talked about a 5G demonstration in Korea that delivered coverage beyond the expected 1,000 feet. That the CEO went to Samsung headquarters made clear Samsung was under consideration. On January 3, Verizon announced that Samsung and Ericsson would be their 5G vendors in the first stage of network building. Verizon is clearly building as fast as they can; I reported last spring the decision had been made to spend $20B to cover 25%-30% of the U.S. AT&T has not said much about the size of their deployment, but I believe they intend to pace Verizon. I hear from T they believe whoever builds 5G first will win a large volume of cable customers. It appears the race will be close. Verizon and AT&T were assumed to be going with Ericsson & Nokia. Alcatel, Lucent, Siemens, Marconi and Nortel are gone. NEC has little presence internationally. Companies like Huawei and ZTE are barred from the U.S. Huawei, Ericsson, Nokia, ZTE, and now Samsung are the choices. Ericsson and Nokia face a Prisoner's Dilemma choice on pricing in the U.S., knowing the other would retaliate in other accounts across the world. Their rational choice would be implicit co-operation to squeeze a little more out of the telcos. Verizon had major incentive to bring in a third vendor. Nokia's position was undermined by a major fail, which required replacing so much equipment they had to discuss it in their financial call. Nokia and Ericsson had also fallen behind in Massive MIMO, which Verizon has had in its plans since at least 2016. link Although MM was invented by Tom Marzetta at Alcatel Bell Labs, Huawei and ZTE were the first to bring it to market. Both delivered production equipment to Softbank and China Mobile in 2016. Alcatel & Ericsson are just catching up. Unlike the European vendors, Samsung the company is very profitable. They passed Intel as the world's largest chipmaker on the strength of the very high memory prices. Their mobile screens are a hot and profitable product. The financials suggest Ericsson and Nokia may merge one day, as is persistently rumored. Tens of thousands of engineers are working to bring mmWave to market years before expected. Samsung Electronics America, today announced it has been selected by Verizon to assist in advancing their 4G LTE Open RAN initiative. With this collaboration, both companies are working to increase network efficiencies, advance inter-carrier interoperability, and prepare a path for virtualized RAN and 5G commercialization. Samsung will supply Verizon with equipment including Remote Radio Heads (RRHs) and Baseband Units (BBUs). These key network elements will also support Verizon’s Open RAN initiative by allowing the ability to interwork with other ecosystem providers. All supporting equipment will continue to enable Verizon’s LTE Advanced capabilities as well as current CAT-M and future Narrow Band IOT platforms. “We are committed to offering our customers a best-in-class network experience through enabling new technology partnerships in an open network ecosystem,” said Ed Chan, Senior Vice President and Chief Technology Architect, Corporate Network& Technology, Verizon. Samsung Networks has been a provider of Verizon femto cells for many years. This latest agreement expands the companies’ relationship to include larger scale 4G LTE Macro gear. This includes incorporating the next generation of Samsung Baseband Units and Remote Radio Heads, with planned deployment in 2018. RIDGEFIELD PARK, N.J. – JANUARY 3RD, 2018 – Samsung Electronics America, Inc. today announced that it has been selected to supply Verizon with commercial 5G Fixed Wireless Access (FWA) network solutions. The two companies will begin by launching commercial 5G services in Sacramento, California in the second half of 2018. “The industry has been discussing 5G connectivity for years, and through our joint collaboration with partners like Samsung, we are beginning to make it a reality for our customers,” said Ed Chan, Chief Technology Architect and Network Planning, Verizon.“Sacramento is an ideal place to begin deploying 5G broadband services, providing a progressive environment for creating future use cases. SEOUL, KOREA – DECEMBER 1, 2017 – KDDI and Samsung Electronics Co., Ltd. have successfully completed the first 5G demonstration on a moving train traveling at over 100 km/hour (over 60 mph). This was achieved along a section of track where the distance between two stations was approximately 1.5km (nearly 1 mile). During the demonstration, the companies achieved a successful downlink and uplink handover as well as a peak speed of 1.7 Gbps. The tests were carried out from October 17th through the 19th in the city of Saitama in Japan, near Tokyo. For the tests, Samsung’s 5G pre-commercial end-to-end solution was used, which is composed of a 5G router (CPE), radio access unit (5G Radio), virtualized RAN and virtualized core. In addition to a successful downlink and uplink handover at more than 100km/hour (over 60 mph), 8K video was downloaded via the CPE installed on-board, and a 4K video filmed on a camera mounted on the train was able to be uploaded. 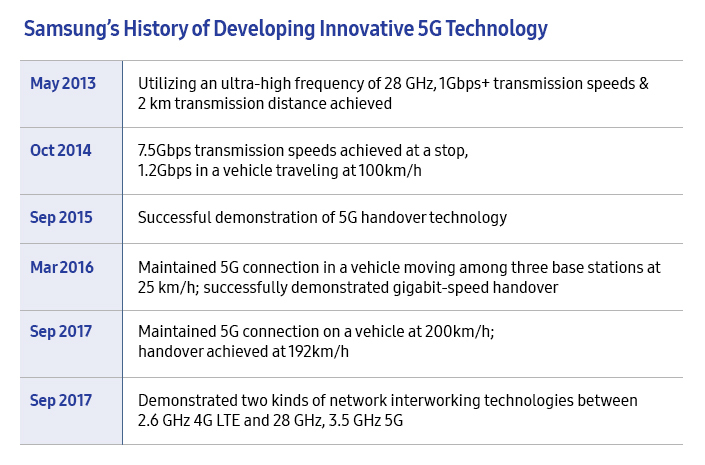 Since 2015, KDDI and Samsung Electronics have been closely collaborating to demonstrate 5G millimeter wave performance in various scenarios. This includes a multi-cell handover demonstration that took place in February, where the device was mounted on a car traveling the busy streets of Tokyo, and a high-speed mobility test with the device attached on a car racing at 200km/h in Yongin, Korea in September. 09.11.17 As Massive MIMO (multiple input, multiple output) promises to deliver faster connection speeds and more data capacity in high-traffic locations – without using any additional spectrum — Samsung Electronics America, Inc. (SEA) and Sprint will demonstrate Massive MIMO technologies at the Fall 2017 Mobile World Congress. At Mobile World Congress 2018, which kicked off on February 26, Samsung Electronics cemented its status as an industry leader by introducing a full lineup of products that will be vital for the commercialization of fifth generation (5G) wireless communications. At the root of this achievement are Samsung’s end-to-end solutions spanning network equipment, devices and chipsets, not to mention a commitment to R&D investment that began in 5G’s infancy, six years ago. Unveiled at the event was a chipset supporting 28 GHz, a 5G spectrum, home devices, base stations and network core equipment. Samsung’s 5G devices, when installed in homes or enterprises, will automatically be recognized by 5G base stations and provided with ultra-fast broadband service of up to 1Gbps, while the network core equipment is responsible for resource management and real-time data traffic distribution. Samsung has demonstrated its technological expertise throughout the evolution of communications – from 2G to 3G and 4G. Indeed, the company was the first to commercialize CDMA (Code-Division Multiple Access) during the 2G era. Samsung was also at the forefront of 4G LTE (Long-Term Evolution) innovation as a key vendor in technologically advanced markets such as the US, Japan, Korea and the UK. Its business has now expanded into rapidly developing India, where Samsung is the sole vendor of the country’s 4G LTE nationwide network. Samsung has been convinced of the potential that the millimeter wave spectrum holds since 2012, and has been investing in 5G R&D ever since. These efforts have resulted in the successful development of beamforming technology that supports directional signal transmission or reception. Based on this achievement, a technology that enables transmission speeds of over 1Gbps and is capable of covering distances of up to 2 kilometers using a 28 GHz band was developed and demonstrated in May of 2013. In 2014, a seamless data transmission speed of 1.2Gpbs was achieved during a demonstration wed Samsung to further accelerate 5G’s commercialization. Handover is regarded as a critical technology for networks as it signifies seamless coverage for smart devices when a user moves between base stations. In March of 2016, Samsung became the first in the industry to successfully accomplish a multi-cell handover demonstration by achieving Gbps-level connectivity while a vehicle moved across three 5G base stations at 25 km/h.In September of 2017, Samsung demonstrated seamless connectivity with a vehicle traveling at over 200 km/h, as well as a successful handover with a vehicle moving at 192 km/h. These remarkable achievements proved that the application of 5G on high-speed trains was a feasible concept. Around this time, Samsung also successfully proved the capabilities of a 4G-5G intertwined network that binds together three spectrums by linking a 4G LTE network that utilizes the 2.6 GHz band with a 5G network that uses the 28 GHz and 3.5 GHz bands. Interworking between different-generation networks is recognized in the industry as a prerequisite for fostering 5G commercialization. By nature, telecommunications service can only begin once an operator has acquired the rights to use a particular spectrum from its government and established infrastructure with its vendor. It is absolutely crucial that the service allows multiple users to simultaneously enjoy seamless connection anywhere and anytime. 5G commercialization is no exception to this rule; cooperation between operators, equipment vendors and device manufacturers is a must. Samsung has been focusing on intensifying its technical and business bonds with operators in markets with advanced 5G adoption such as Korea, the US and Japan. The US is the first country to have acquired the 28 GHz spectrum, and it plans on launching FWA (fixed wireless access) service using 5G technology in the second half of this year. Samsung is in the midst of carrying out 5G trial services in key US cities together with Verizon and has already deployed 5G networks in seven of the eleven cities – Sacramento included – where Verizon provides its service. To add to the list are the 5G trials being carried out in Indiana with AT&T, as well as another with T-Mobile. Korea is quickly gaining recognition as a testbed for the latest technologies. In September of 2017, together with the Korean telecommunications operator SK Telecom, Samsung successfully demonstrated, for the first time ever, how 4G and 5G networks can interwork with one another. Japan has targeted the year 2020 for 5G commercialization, to coincide with a large-scale sporting event that will be held in Tokyo. Together with the country’s leading operator, NTT DOCOMO, Samsung successfully demonstrated the 5G technology in a vehicle traveling at high speed in November of 2016. With KDDI, another key operator in Japan, Samsung conducted a 5G demonstration on a Tokyo highway in February of last year. In December of the same year, the joint efforts extended into a 5G test held on a high-speed train. Also collaborating with Samsung to accelerate 5G commercialization is the French operator Orange. Together with Korea Telecom and Verizon, Samsung has also established the specifications required for 5G trial services in Korea, as well as commercial FWA service in the U.S.